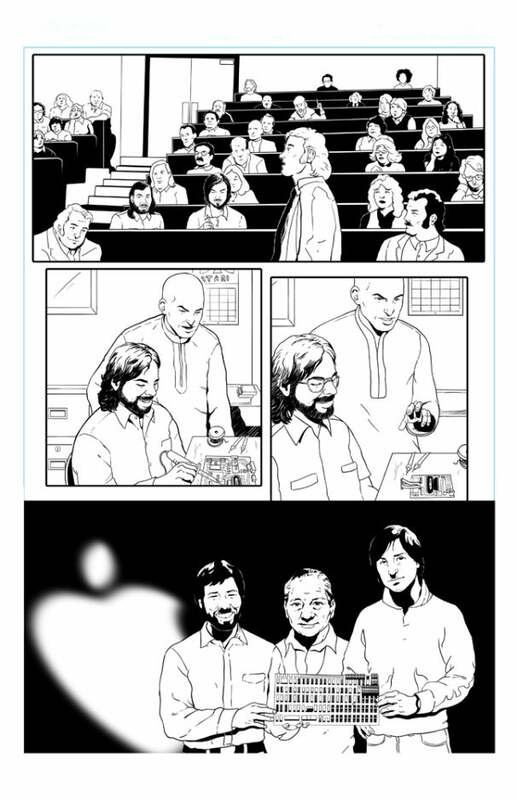 A new biography of Steve Jobs will be published in August but with a difference: it's a 32-page comic book. "Steve Jobs: Co-Founder of Apple" portrays the life of the irascible genius behind the Mac and iPhone in drawings, from his birth to modern day. 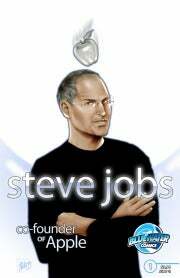 The supporting cast includes Steve Wozniak and Bill Gates, and the book shows Jobs at key events in his career, such as the launch of the iPod. PCWorld managed to snag previews of some of the pages, although Bluewater points out these are a work-in-progress and that the pages have not yet been colored or had speech bubbles put in. The $3.99 book is written by CW Cooke, drawn by Chris Schmidt, and has cover art by Joe Phillips, who has worked on DC comic titles. "[Jobs has] been called an innovator, risk-taker, a visionary and a genius. He's also been called unscrupulous, an egomaniac and a corporate pirate. Both sides of this complex personality are examined," claims the blurb on Bluewater's website. Jobs notoriously dislikes biographies. When the unauthorized "iCon: The Greatest Second Act in the History of Business" was published by John Wiley & Sons, Jobs allegedly ordered every book by the publisher to be pulled from the shelves of Apple stores. However, perhaps because of his recent brushes with mortality, Jobs recently authorized Walter Isaacson to write "iSteve: The Book of Jobs," due to be published next year. The book is eagerly anticipated, and is currently at ranked #4 in the business biographies section at Amazon.com. This isn't the first time Bluewater has published a graphic novel biography of a tech luminary. This year it profiled Facebook founder and CEO Mark Zuckerberg in comic form, which sold-out almost right away. It is currently being expanded into a full graphic novel, to be published in September. Other biographies by Bluewater include those of radio celebrity Howard Stern, comedienne Kathy Griffin, and Green Lantern star Ryan Reynolds.